How to do better product quality inspection? On many instances, errors in measurements can occur when making measurements in the production process. There errors typically originate from inaccuracies created by mistakes by personnel using the measurement devices or the use of measurement devices that are not precise in measurements. Coordinate Measuring Machines (CMM) are machines that eliminate these errors by introducing more efficiency, more accuracy and more flexibility to the measuring system through their programmability thus ensuring highest quality results. Programming the machines ensures that they can perform a task repeatedly without the need for re-calibration with each use. This results in the production of products with uniform measurements. Because of the high level of accuracy introduced by CMM systems, introducing CMM to the production process can improve the qualities in your products. However, selecting the right CMM system for your production system can be a challenging endeavor as you could select a system that does not fit your specifications or a system that introduces a level of accuracy not necessary in your quality system. When selecting a CMM system, there are several factors that you should take into consideration. 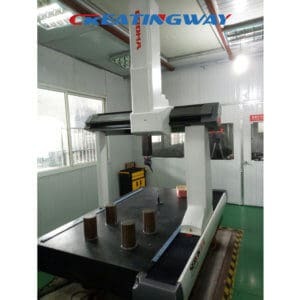 Today, Creatingway will take points to you how to do product quality inspection process for you. How to Do Better Quality Inspection for Your Product Quality Control? It is very important to consider the mobility of the CMM system. The system to be installed could either be portable or fixed. You can install portable CMM systems if the parts to be measured are too heavy to be moved or if they are located in areas that are not easily accessible. On the other hand, you can install a fixed/stationary CMM system to take measurements of parts that are easily movable. Stationary CMM systems can be categorized in Bridge, Cantilever, Horizontal Arm, and Gantry systems. Cantilever CMMS maximize accuracy but are least flexible. Horizontal arm systems maximize flexibility but are least accurate. Gantry and Bridge systems have levels of flexibility and accuracy that lie between the two extremes. The probes determine the quality of your CMM system. Probes can be categorized into contact probes utilizing touch scanning and non-contact probes utilizing lasers for optical scanning. Multi-sensor probes combine elements of both the optical and touch scanning. Contact probes are categorized into touch trigger probes and analog scanning probes. Analog scanning probes record 50 to 60 times more data than the touch trigger probes. Moreover, they can also work as a touch trigger probe thus increasing flexibility. Non-contact probes are either vision-based or laser-based and are suited for use in parts that require higher degrees of precision, are smaller in size, are complex in shape or that can be easily deformed. Operation of the CMM is dependent on both the software and hardware components. Most CMM manufacturer support dimensional measurement interface standard (DMIS) programming language. However, you might need to customize your CMM software to support functions that are not supported by DMIS. The CMM software increases confidence in the measurements taken by simulating different measurements on the machine. This is especially important in measurements that require a high level of accuracy. Moreover, it is also necessary to consider the compatibility of the software with the CMM model used. To ensure compatibility, choose a CMM system with a direct CAD interface (DCI). DCI allows the CMM to use CAD data without having to translate the data first through other programming languages. Even while using CMM systems, it is necessary to ensure that the completed product fits the product specifications required. Errors could occur in the production process if the CMM system is faulty or if it is not accurate to the degree required. Therefore, you can test the product by running tests of the product after production is complete. You can also test the product by running simulations using simulation software. The software estimates the functionality of the components based on the specifications of the whole product in which the component is to be installed. Such simulations are necessary to avoid damages to the entire product caused by any parts that may become faulty during production.